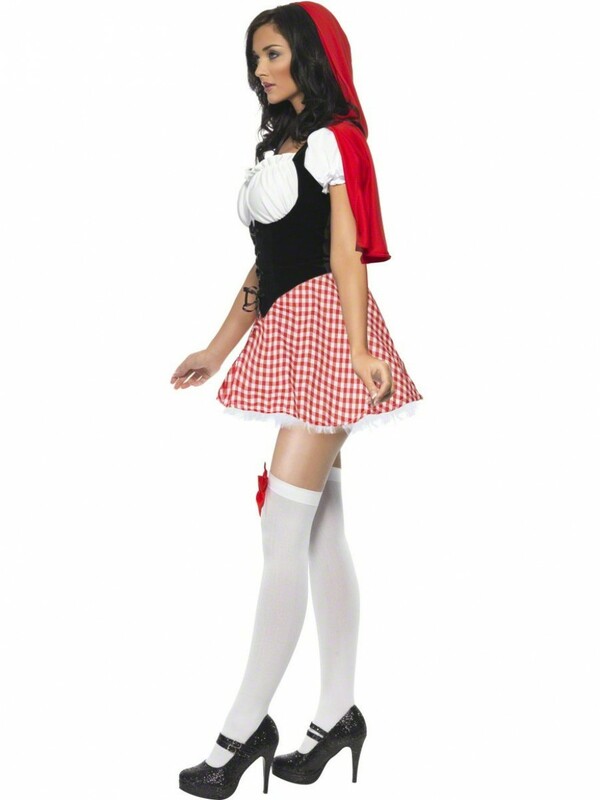 A classic Red Riding Hood costume which includes dress and cape. Fun for a Fairytale theme or any fancy dress event! This classic style Red Riding Hood includes a dress and hooded cape. The dress has a check skirt with a lace underskirt and corset design front section, as pictured. The corset is made front mock suede and fastens with satin ribbon (included). The back section of the material, the bust and the arms are made from stretchy material for comfort and sizing flexibility. The dress has a zip fastening at the back. The matching red cape has an attached hood and a black satin tie to fasten around the neck. A classic Fairytale outfit for any fancy dress occasion! Available in sizes Small (UK 8-10), Medium (UK 12-14) and Large (UK 16-18). Please see the below sizing guide for full information. Please note that the shoes and stockings are not included.